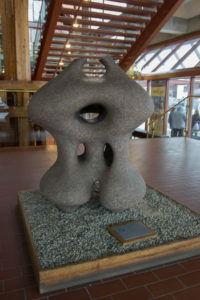 Well-known in modern sculptors’ circles in Canada, Hilton was selected to choose ten artists from six countries to create a permanent collection of works commemorating the 1978 Commonwealth Games in Edmonton. Biography: Charles Hilton was born in 1937 in Melville, Saskatchewan. He studied sculpture at the University of Manitoba (1963), after which he moved to Alberta, where he taught pottery and sculpture at the University of Alberta. In 1976, he represented Alberta at the Olympic Arts & Culture Program during the summer Olympics in Montreal. He was also founding Director of the Commonwealth Sculpture Symposium during the 1978 Commonwealth Games in Edmonton, and led several ceramics seminars and workshops in Edmonton and Calgary in the early 1980s. Hilton became a prominent sculptor in Edmonton, his abstract work appearing in numerous solo and group exhibitions in Canada and Japan. He works mainly in clay, but has also worked in bronze, marble and wood; he considers his work as primarily expressive. Hilton now lives in British Columbia.